Just how important was horse equipment in the scheme of battlefield victories? Arguably, just as important as were arms, ammunition or any other article of military necessity. Despite the evolving tactics of mid-19th Century warfare, the cavalry and field artillery’s role nevertheless remained central to an army’s effectiveness. Mounted cavalry served several important functions; as the virtual eyes and ears of the huge armies, their escorts and couriers, flankers and shock troops in battle, behind the lines as piercing raiders and partisans, and as an independent fighting force. For artillery, the deployment of field pieces into a battle, offensive and defensive tactics, pursuit of an enemy or even siege operations required artillery cannons to be mobile. Horses were the fastest and most reliable method of transportation at the time. Thus, for both branches the adequate supply of horse equipment and therefore their usefulness, was undeniably important. From its uncertain beginnings to the war’s end, the history of Confederate saddle manufacturing is a cloudy and convoluted story of profound struggle. One might think that after the thousands of years that man has ridden the horse, by 1860, something so simple as the saddle would be universally acceptable in western civilization. However, the answer was not at all so obvious. Throughout the four years of struggle for Southern independence there was a constant battle being waged within the Confederate Ordnance Bureaus’ arsenals to find and manufacture satisfactory cavalry and artillery saddles, bridle bits, saddle blankets even curry combs. Still, the Confederacy’s difficulties in adopting adequate horse furniture was not due to a lack of ingenuity nor was it unique to the South. The War Between the States occurred during a period of tremendous world wide change in the composition of riding saddles. For two hundred years Americans relied upon European influences to guide their preferences for saddles. However, since the 1820s, the Spanish (also referred to as ” Mexican”) methods of tree configuration and construction increasingly altered saddle designs for usefulness, durability and the comfort of both horse and rider. Most notably, the new design of the pommel, cantle and side bar, and the method of encasing the tree with wet rawhide for strength, significantly and forever changed the way Americans and others saddled the horse. In the North, the pre war adoption of the McClellan and Grimsley horse equipment as generally described in the Ordnance Manual of 1861 set a standard that saw little substantive change throughout the conflict. Conversely, though the Confederacy was initially guided by the earlier Federal manuals and General Orders, in practice they instituted numerous changes. 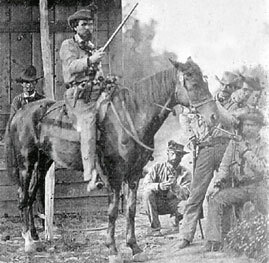 For both sides, the war provided the ultimate field test for its horse equipment but in stark contrast to their Northern counterparts, the Confederate Ordnance Bureau would prove intrinsically more flexible and less encumbered by bureaucracy when it came to the need for decisive change or adaption. When necessity dictated, which it often did, the bureau routinely utilized less than officially sanctioned materials and methods such as substituting enamelled cloth or rope for leather, hand forged instead of cast iron bridle bits, saddle blankets made from Spanish Moss and collars made of corn shucks. Some equipment evolved during the course of the war including both the artillery driver’s and valise saddles, traces, cavalry halters, and their most renown piece of equipage- the Jenifer cavalry saddle. In fact, its adoption, evolution and subsequent replacement by the McClellan and Texas saddles represent the most striking examples of the Confederate Ordnance Bureau’s fluidity. For a far more complete and detailed overview we recommend you purchase Mr. Ken R. Knopp’s book: CONFEDERATE SADDLES AND HORSE EQUIPMENT.